Thousands of people gather to listen to the virtuoso Orthodox ringing of the world-wide thundering Kamensky bells and plunge into the magical world of the ancient tradition of bells ringing -- the symbol of the revival of Orthodox Russia. The highlight of the 2014 festival was the gigantic 18-ton bell cast specifically for the Alexander Nevsky Monastery in St. Petersburg. This is the largest bell produced in the entire history of the company. Bells cast in Kamensky are known for their clean song and the beauty of the filagree decorating their icons. It is considered that a bell rings well when at least six seconds pass from the moment it is hit to the end of its hum. The Kamensky masters learned to create bells whose ring ranges from 9 to 12 seconds long. The place for the festival was not chosen randomly. 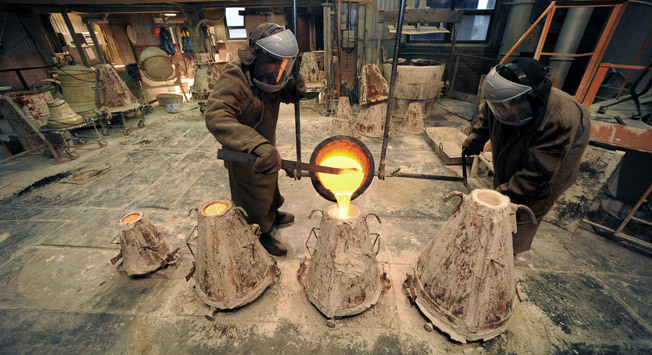 Kamensk is considered the “bell capital of Russia,” since it is here that the largest bell factory in Russia and Europe, “Pyatkov and K” is located. Its founder -- the caster Nikolai Pyatkov -- cast his first bell according to an ancient method more than 20 years ago. Today Kamensky bells adorn St. Basil’s Cathedral and Donskoy Monastery in Moscow, the city chimes of Yaroslavl, Velikiy Novgorod and the Marble Palace in St. Petersburg, and can be heard in more than one thousand churches from Moscow to Anchorage in Alaska, including the Orthodox parishes in the USA, Canada, Greece, Africa, Asia and Eastern Europe. The company casts more bells than the entirety of Europe combined: 100 - 200 thousand tons of bronze bell metal every year. The bell factory is not the only attraction in Kamensk-Uralsky. It is a green, picturesque town, full of undiscovered historical secrets, unique nature, old architecture, churches and the oldest industrial enterprises. It was also the first city factory in the Urals: the first steel, first cannon, first bell and even the first art casting were created here, in the iron-smelting (iron works) factory, which at one time was the largest in the world. The history of the city dates back to 1644 after the founding of the Holy Dormition Monastery Dolmatovsky. In 1682, monks, after finding iron ore in the area, began iron production. In 1701 Emperor Peter I chose this territory for the construction of the first metallurgical factory in the Urals, around which the city grew. For more than half a century the Kamensky state factory produced cast iron cannons and cannon balls for the Russian army and navy. Kamensk is included in the list of historic Russian cities and exists as if in two dimensions: the old settlement of the late nineteenth to early twentieth centuries, and the modern contemporary city of our day. This is due to the unique planning of Kamensk: the historic and business centers do not intersect. In the old part of the city unique architectural ensembles from the early eighteenth century to the early twentieth century are preserved. The major architectural landmark of Kamensk is a complex: a monument of history and architecture by famous architect Mikhail Malahova. Today they remain nearly intact and are visible around the Cathedral square, where two centuries ago, they joined the factory and around which the city grew. It was home to the principal steward of the plant, the factory office, as well as administrative, industrial, residential, public, commercial and religious buildings. Many of the old buildings, upon closer inspection, specify their date of construction. The architectural gem of Kamensk, the estate of merchant Vorobyov, is the only place where construction from the nineteenth century has been fully preserved: stables, barns, silos, buildings for supplies and residential buildings. Unfortunately, the estate is slowly collapsing. From World War II until the end of 1970 a sanitary-epidemic station was located there, and various poisons were stored in the red brick vaults. Many offices changed. Several tenants treated the historic value of the site like vandals. Today the manor remains empty. Kamensk is a great place for hiking and cycling, during which it is possible to not only explore a part of the mining in the Urals, stray through the old picturesque streets among the unusual old buildings and and observe the way of life and daily life of those who live in the Urals, but also enjoy the beautiful landscape. Located in a scenic area near the confluence of the Iset and Kamenka rivers, the town has its own unique complex of monuments to nature, directly within its town limits. The pristine beauty of numerous points in the city can be reached in 15-20 minutes. The vicinity of Kamensk is considered an open-air museum. This old industrial town seems to be hidden between lush forests, mountains and two rivers, the Iset and Kamenka, with amazing cliffs and canyons along their banks, with outlets for globs of lava, which formed from the action of an ancient powerful volcano and geological rocks that are hundreds of millions of years old. When the river grows shallow, it is still possible to find the teeth of ancient sharks here. To explore the shores of the protected Iset it is possible to walk, ride a bike or travel on the water: rent a boat, book a tour on a boat or a river tram through the Isetsky Canyon. During the journey it is possible to observe herons, ducks, relic plants and unusual iridescent flowers that bloom from the spring to the fall, and most importantly, religious sites. For example, the cross worshipping the founding-fathers of the city from the Dalmotskovo monastery, the cliffs of the “Seven Brothers,” which stretches across the left bank of the Iset for 250 meters, the rarest railway bridge “Butterfly,” the Smolinski caves with grottos and passages, a 20-meter mysterious stone array known as “Bloody Finger,” the “Stone Gate” -- a karstic bridge 20 meters tall, resembling a portal into another dimension (one of seven similar natural monuments in the world), and many others. A full excursion will take roughly three hours long. Incidentally, the border of the Urals and Siberia and the 62nd meridian allegedly runs through Kamensk via the Iset river. If you are lucky enough to visit Kamensk during the world championships of motocross racing on a sidecar motorcycle (which generally occurs in August), the town will be transformed into a sporting mecca before your eyes, which welcomes thousands of fans. Kamensk is the only city in Russia where stages of world championship motorcycle racing occur. Competitions are held on unique motorcycle routes in the center of the city, which has international certificates recognizing compliance with international standards. Kamensk-Uralsky is known as the home of champions and winners of the world, Europe, the Soviet Union and the Russian Federation. Young residents of Kamensk learn to drive motorcycles from the age of six. Fans of winter tourism will also not be bored. Kamensk is home to many avid skiers, therefore the forest parks in the vicinity of the town are dotted with ski slopes, as well as resorts that offer ski and skate rentals. Also there is an additional route in Kamensk, the skiing and biathlon complex “Birch Grove,” which has been dubbed “Switzerland of the Urals.” The trail of both large and small slopes demands good physical preparation from racers. The facility is open for summer and winter training for students of the Olympic reserve school, as well as the mass of vacationing citizens and guests of the city. Here it is possible to meet current Olympic champions -- for example, the two-time Olympic biathlon champion, Sergei Chepikova, under whose patronage the track was built. Summer seekers of adrenaline and various rafters can risk going to the famous Revun rapids, which are located 25 km along the Iset above the city. The roar of the high-speed rushing rapid mountain stream can be heard for 300 meters, while its elevation is at roughly 40 meters. Researchers of mysterious phenomena claim that a special mythical aura surrounds Kamensk. In the 1930s and 1940s Kamensk was practically a girded place of banishment, with a number not less than 12. Now houses are mainly in their place. Several psychics and fortune tellers live in the city, and residents complain about poltergeists, goblins and other mysticism. Those who want to test their nerves can visit the Old Ivanovsky Cemetery. It is located in the old part of the city right at the border of the Sobachi village (Romani), just a few meters from the boundary of houses. The cemetery was closed during the 1960s, and is unique because it is possible to find many old graves dating from the end of the nineteenth to the early twentieth century. In addition to townspeople, soldiers of WWII are also buried there. The cemetery is very overgrown and gradually turns into a forest, through which one can explore and descend down a mountainside to the Iset river. What else is there to see, if there is time remaining? Pitchi Island: popular with couples, children and parents is the ornithological center, which brings together roughly 100 species of birds, including the largest collection of rare pheasants and swans in Russia. Kamensky Yard: a tourist center for the production of filigree birch bark, as well as a small petting zoo, including a family of deer. Golden Valley: a farm for African ostriches, who are not afraid of the harsh winters of the Urals.